WOLF CREEK PASS, Colorado — Davey Pitcher, the president of Wolf Creek Ski Area, sighs and looks out his office window. Though it’s closed for the season, his ski area, located at 10,500 feet in the San Juan Mountains, is still covered in six feet of powder. But it is the other white stuff that weighs heavily on Pitcher’s mind these days; his desk is buried in an avalanche of official-looking paperwork. Pitcher is preparing to go toe-to-toe with Texas billionaire Billy Joe "Red" McCombs, co-founder of the media behemoth, Clear Channel Communications Inc. McCombs and his venture partner, Bob Honts, an Austin, Texas-based real estate developer, want to build the state’s biggest ski resort village on a 288-acre enclave in the middle of Wolf Creek Ski Area. "The Village at Wolf Creek" would include 1,200 rooms in three hotels, 129 lots for single-family homes, 1,661 multi-family units, 4,525 covered parking spaces, 222,000 square feet of commercial space — and a population of 10,000, year-round. For most ski areas, developments like this are welcome; the industry has been flat for several years, so the real money is to be had in real estate (HCN, 12/7/98: Vail and the road to a recreational empire). But Pitcher says the village, planned for a meadow called Alberta Park that links the South San Juan and Weminuche wilderness areas, is in the best interests of neither the ski area nor the environment. "Skier-driven, backcountry-oriented ski areas like Wolf Creek are an endangered species in this state," he says. "We refuse to take a ‘build it and they will come’ view of skiing." The current fracas is just the latest chapter in an 18-year saga. McCombs acquired Alberta Park in a land trade with the Forest Service in 1986. The trade was originally denied by officials with the Rio Grande National Forest, who argued that it wasn’t in the public’s best interest to trade away land surrounded by national forest. But two weeks later, bureaucrats in Washington, D.C., ordered him to change his decision. "We’re still mystified as to how the decision was changed," says Pitcher, who initially supported the land swap. "There’s no paper trail and the Forest Service isn’t talking." McCombs sat on the land for years, but in 1998, he brought Honts on board. Since then, The Village at Wolf Creek has ballooned from a small resort to a city on a mountain. Thanks to local environmentalists, however, the Forest Service may still have the power to stop the development, or at least limit its scale. 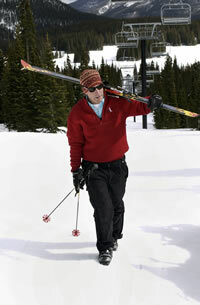 In 1999, the group Colorado Wild appealed a Forest Service decision allowing Wolf Creek to build a new chair lift. The lift, which would carry skiers from the development to the slopes, was the linchpin of McComb’s development scheme. The group settled its appeal in exchange for a 250-foot buffer between the lift’s access road and the private land. That would require the Forest Service to complete an environmental analysis under the National Environmental Policy Act (NEPA) before the developers could get access for construction. McCombs and Honts have fought to gain that access without triggering NEPA — even allegedly trying to strong-arm Pitcher into illegally constructing a road and utility corridor. When Pitcher wouldn’t budge, the developers asked a Texas congressman to attach a rider to the 2002 Farm Bill that would have given them access to the corridor and authorized construction of a five-mile-long natural gas line through wilderness in the San Juan and Rio Grande forests. That attempt was foiled by The Wilderness Society in Washington, D.C. In November 2003, McCombs and Honts finally submitted an application requesting road and utility easements across the 250 feet of public land. The Forest Service hopes to issue a draft environmental impact statement in late summer. Honts says that the agency can’t deny access to the property and threatens to sue if the development is blocked. He hasn’t taken kindly to Pitcher’s recent opposition, and says he has contracts Pitcher signed in 2000 promising his support. "I don’t know why Davey changed his mind about our project, but I know he doesn’t have the right to do it," he says. "This resort will be built with or without his support." The Forest Service held three public scoping meetings that were so packed that a fourth had to be added. "The ski area seems to have a lot of allies," says Steve Brigham, NEPA coordinator with the Rio Grande Forest. "It’s a real battle, though, and the Forest Service is stuck right in the middle." The author is a former HCN intern.